John Bouvier Kennedy "Jack" Schlossberg (born January 19, 1993) is the youngest child and only son of Caroline Kennedy, the former U.S. Ambassador to Japan, and the only grandson of John F. Kennedy, the 35th U.S. president. He graduated from Yale University in 2015 and entered Harvard Law School in the fall of 2017. Schlossberg was born in New York City on January 19, 1993, to designer Edwin Arthur "Ed" Schlossberg (born 1945) and Caroline Kennedy (born 1957), daughter of the U.S. president John F. Kennedy (1917–1963) and First Lady Jacqueline Bouvier Kennedy (1929–1994). Schlossberg has two older sisters, Rose and Tatiana. Schlossberg's father comes from an Orthodox Jewish family of Ukrainian descent, and his mother is a Catholic of Irish, French, Scottish, and English descent. Schlossberg was raised in his mother's religion, and he also observes Jewish traditions, holidays, and holy days. As the lone grandson of John and Jacqueline Kennedy, Schlossberg became the only surviving male descendant of JFK's immediate family after his maternal uncle, John F. Kennedy Jr., died in a plane crash in 1999. In eighth grade, Schlossberg co-founded ReLight New York, a non-profit organization that raised more than $100,000 to install compact fluorescent lights in low-income housing developments. In 2011, he graduated from Collegiate on the Upper West Side of Manhattan. He was elected by his class to make a speech at the commencement ceremony. Schlossberg attended Yale University, graduating in 2015 with a degree in history with a focus on Japanese history. While there, Schlossberg wrote for the Yale Daily News and Yale Herald, and received EMT training. Schlossberg entered Harvard Law School in the fall of 2017. He is in the joint degree program of J.D. and M.B.A. from Harvard Law School and Harvard Business School. In October 2015, after graduating from Yale, Schlossberg started working at Rakuten, Inc, a Japanese internet and e-commerce company, in Tokyo, Japan. He met Hiroshi Mikitani, the CEO of Rakuten, while visiting Sendai accompanying Caroline on duties. In 2016, Schlossberg worked for the U.S. Department of State and Suntory Holdings Limited, a Japanese brewing, distilling and beverage company. In November 2013, Schlossberg attended the Medal of Freedom Award Dinner to commemorate the 50th anniversary of his grandfather's death where he introduced President Barack Obama. Schlossberg is a member of the John F. Kennedy Library New Frontier Award Committee, for which he has acted as the award presenter. He is on the committee of the Profile in Courage Award and was the host for the 2014 ceremony. Schlossberg made several public appearances in Japan and the United States accompanying his mother Caroline on duties while she was served as the U.S. Ambassador to Japan from 2013 to 2017. In May 2014, he and Caroline visited Fukushima Prefecture, Japan. On May 5, they toured Fukushima Daiichi Nuclear Power Plant wearing yellow helmets and white protective suits with their last names emblazoned on them. He said there, "I hope my peers, my generation in the United States will keep Fukushima in mind and understand that there is still work to be done and we can all do something to help." On April 10, 2016, he and Caroline greeted the then U.S. Secretary of State, John Kerry, who arrived at the Iwakuni Marine Corps Air Station in Yamaguchi Prefecture, Japan to attend the G7 foreign ministers' meeting in Hiroshima prefecture. In November 2017, Schlossberg presented the New Frontier Award to U.S. Congressman Carlos Curbelo (R-Fla.) and May Boeve, executive director of 350.org. On May 11, 2018, Schlossberg made his acting debut as Officer Jack Hammer on the eighth-season finale of the television show Blue Bloods. In 2017 he was named to the Vanity Fair "Best Dressed List". In September 2012, Schlossberg stated his interest to pursue a career in politics. Schlossberg in a November 2017 interview with People, he stated he is a fan of Dwayne "The Rock" Johnson. ^ a b McNeil, Liz (May 6, 2015). 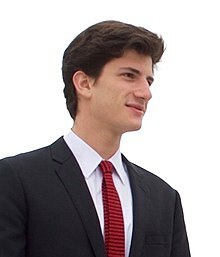 "JFK's Grandson Jack Schlossberg: 5 Things to Know About Him". People. Retrieved July 12, 2015. ^ a b Zibart, Eve (June 18, 2012). "Kennedys 4.0: The Dynasty Endures". Boston Common. Retrieved December 12, 2012. ^ Rachel Shukert (May 8, 2017). "The First Jewish President?". Tablet Magazine. Retrieved July 11, 2017. ^ Oppenheimer, Jerry (February 27, 2013). "JFK's heir apparent". New York City: New York Post. Retrieved May 20, 2013. ^ "Jack Schlossberg Commencement Speech Part 1". August 1, 2011. ^ Danielle Brennan (November 21, 2013). "JFK's grandson takes center stage: 9 things we know about Jack". "Today". Retrieved February 8, 2014. ^ "Caroline Kennedy and son Jack Schlossberg on JFK, Obama and her Met Gala dress". Today. May 5, 2017. Retrieved May 16, 2017. ^ "JFK's grandson on Harvard Law School: 'I don't have a life, but that's what I signed up for.'". November 17, 2017. Retrieved July 9, 2018. ^ "ケネディ駐日米大使の息子が楽天入社　営業など担当". The Nikkei. December 16, 2015. Retrieved September 3, 2016. ^ "Barack Obama: Press Release - President Obama Announces More Key Administration Posts". American Presidency Project UC Santa Barbara. November 18, 2016. Retrieved September 7, 2017. ^ Nedra Pickler (November 20, 2013). "Obamas, Clintons to honor JFK at gravesite". Associated Press. PBS. Retrieved February 13, 2014. ^ "Hawaii Congresswoman and Crowd-Funding Pioneer to Receive 2013 John F. Kennedy New Frontier Awards". John F. Kennedy Library. November 11, 2013. Retrieved February 13, 2014. ^ Associated Press (November 13, 2014). "Myrick wins Kennedy innovation award". The Ithaca Journal. Ithaca, New York: Gannett Company. Retrieved January 19, 2015. ^ McNeil, Liz (May 7, 2014). "Lauren Bush Lauren Raves About Jack Kennedy Schlossberg". People. United States: Meredith Corporation. Retrieved January 19, 2015. ^ "JFK grandson Jack Schlossberg tours nuke plant with Caroline Kennedy". NY Daily News. May 14, 2014. Retrieved October 4, 2017. ^ "Kennedy tours wrecked Fukushima plant for first time". Japan Times. May 14, 2014. Retrieved October 4, 2017. ^ "U.S. ambassador Caroline Kennedy welcomes Sec. Kerry to Japan for G7 meetings". The Washington Post. April 10, 2016. Retrieved October 4, 2017. ^ a b Pennington, Juliet; Dowd, Kathy Ehrich (November 17, 2017). "JFK's Grandson Jack Schlossberg Talks Climate Change and Why He's The Rock's 'Greatest Fan'". People. United States: Meredith Corporation. Retrieved May 12, 2018. ^ Clerk of the United States House of Representatives (November 13, 2017). "Curbelo to Receive 2017 John F. Kennedy New Frontier Award". United States House of Representatives. Washington, D.C.: Library of Congress. Retrieved May 12, 2018. ^ a b Haas, Mariah (May 12, 2018). "John F. Kennedy's Only Grandson, Jack Schlossberg, Makes His Acting Debut on Blue Bloods". People. United States: Meredith Corporation. Retrieved May 12, 2018. ^ Meredith Goldstein (September 6, 2017). "Vanity Fair names Kennedy grandson Jack Schlossberg to its best-dressed list for 2017". Boston Globe. Retrieved September 11, 2017. ^ O'Shea, James (September 9, 2012). "JFK's only grandson set to pursue a political career after college". New York City: IrishCentral. Retrieved May 20, 2013.